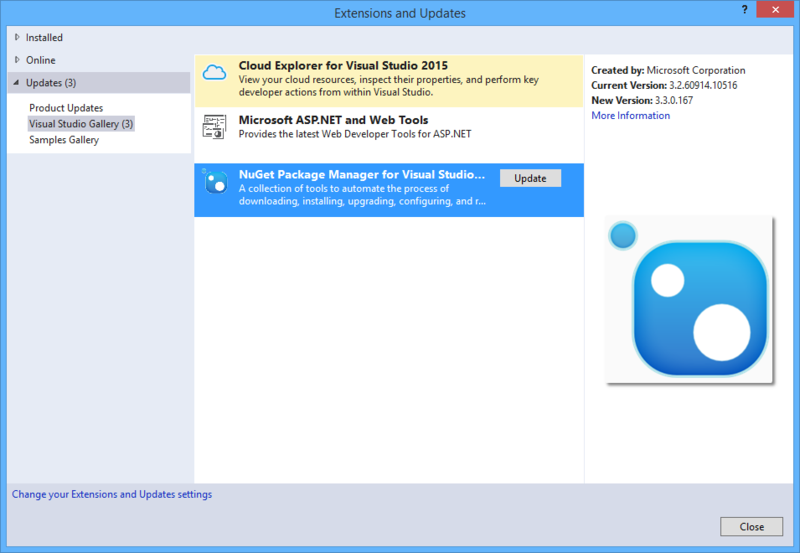 In Visual Studio 2010, NuGet is available through the Visual Studio Extension Manager. 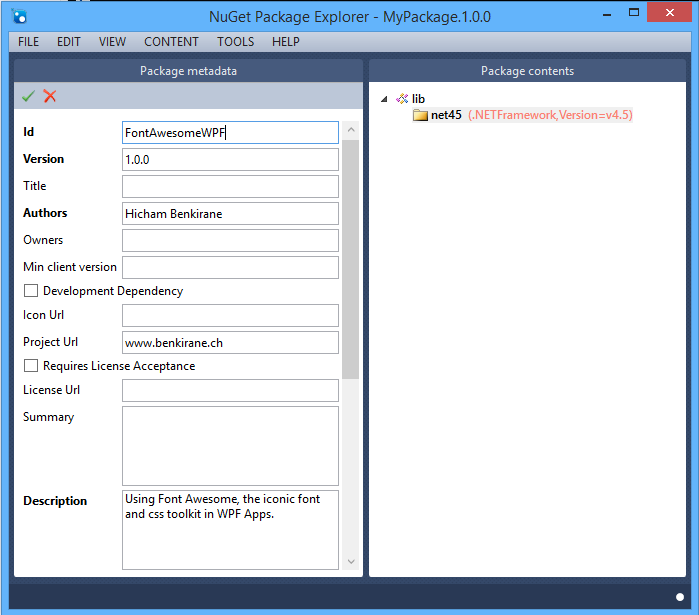 Starting with Visual Studio 2012, NuGet client is fully integrated in every edition by default. In this Example we’ll be using Visual Studio 2015. To check if any NuGet update is available, we’ll navigate to Tools -> Extensions and Updates… and we’ll click the Updates tab. We’ll select NuGet in the list and then we’ll click Update. When the update is completed, we’ll close and re-open Visual Studio. 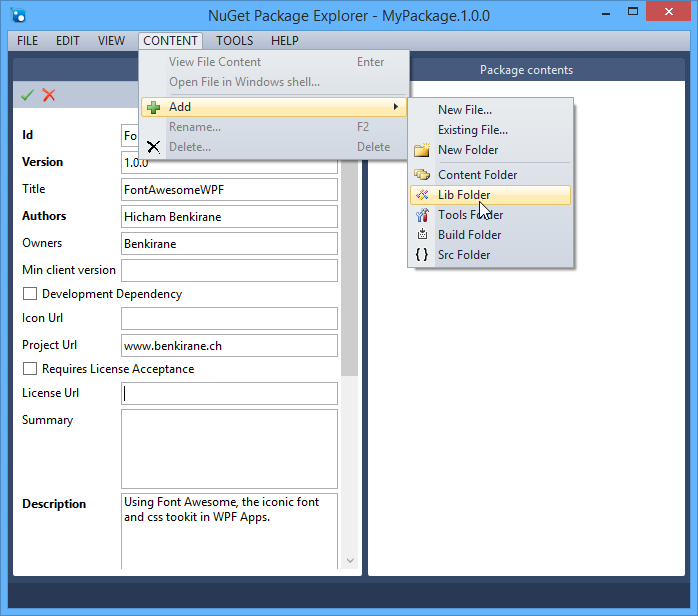 To interact with NuGet directly from the command line, we’ll install the NuGet.exe client tool(version 3.X). We’ll add NuGet.exe to the PATH environment variable. 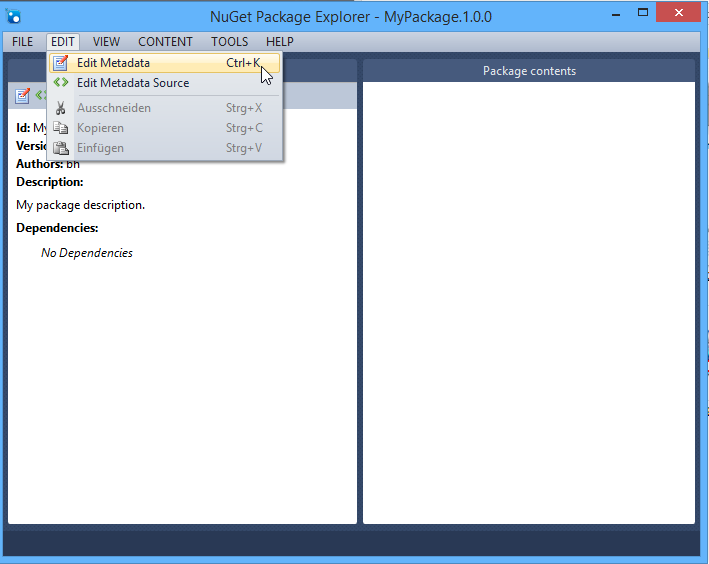 Next, we’ll install the NuGet Explorer Package to interact graphically with NuGet packages. This is a ClickOnce application, so no installation steps are required. 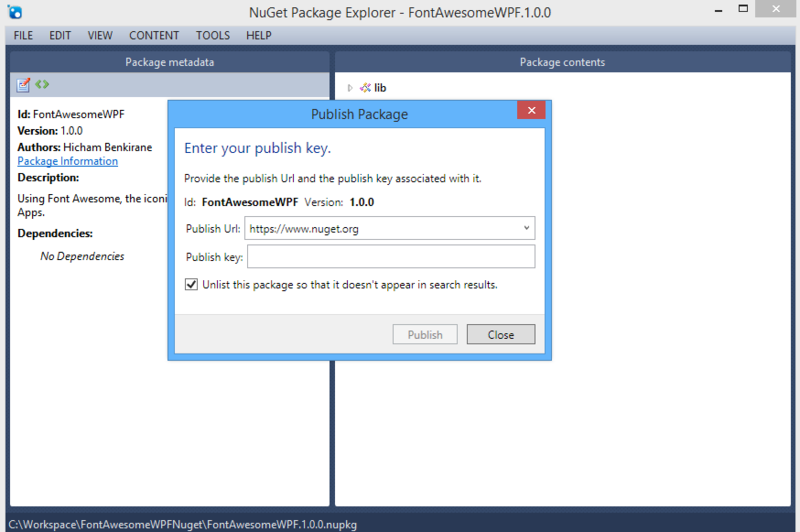 In this example we’ll be using the source code of my last post Using Font Awesome in WPF to demonstrate how to create a NuGet package. First of all, we’ll create a new class library project by selecting Project from the File -> New Menu. Under Installed -> Templates ->Visual C#, we’ll select Class Library. We’ll enter FontAwesomeWPFNuget for the solution Name and we’ll click OK.
We’ll add font-awesome.css and fontawesome-webfont.ttf to the fonts folder. We’ll add CssParser.tt and FA.ttf to the project. 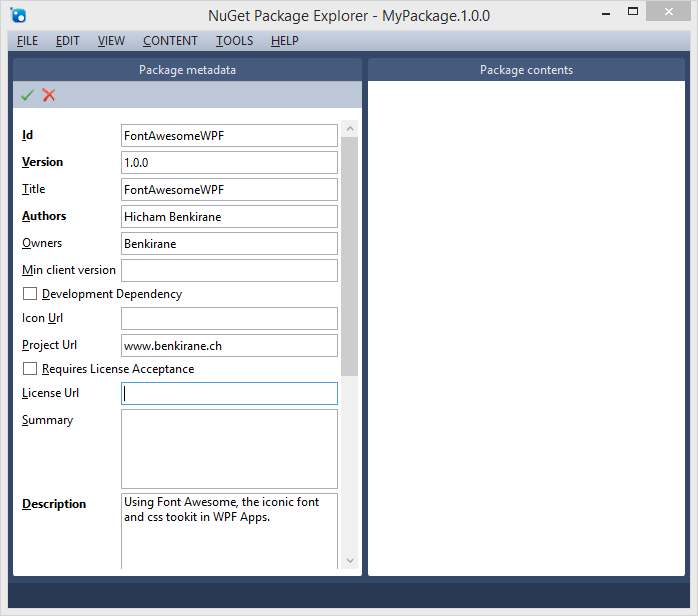 Now we’ll build the solution, and if no errors are encountered, we’re ready for creating a NuGet package. We’ll cover package creation through the interactive GUI and then we’ll do the same with the command line. 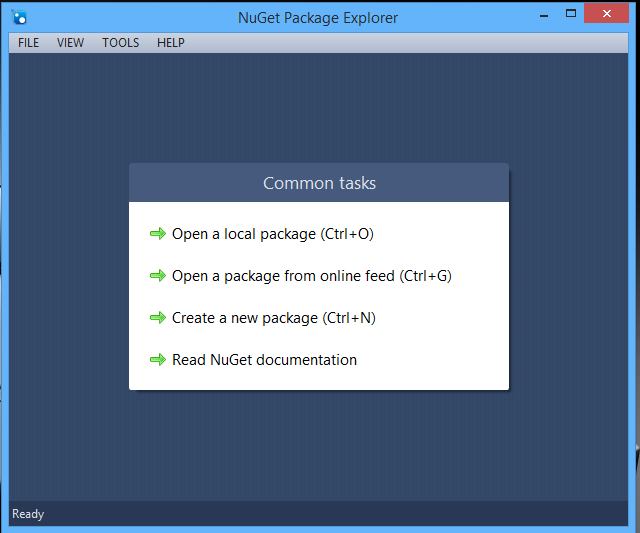 We’ll run NuGet Package Explorer and we’ll select Create a new Package from Common tasks. Next, we’ll select Edit -> Edit Metadata to edit the created metadata file. – Description: Using Font Awesome, the iconic font and css tookit in WPF Apps. By navigating to CONTENT -> Add -> Lib folder, we’ll add a library folder that will contain assemblies. Since we are creating a package targeting the .NET Framework Version 4.5, We’ll create a folder for this specific .NET Version. We’ll right-click on the lib folder in the Package contents and we’ll choose Add .NET folder -> v4.5. We’ll press Ctrl+S to save the package. 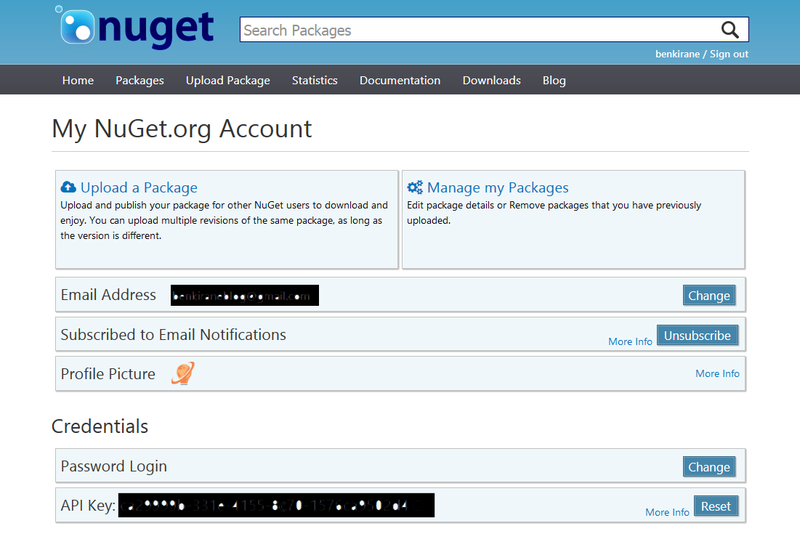 The first thing we’ll have to do before publishing our package to the official NuGet server is to create a NuGet account. To create an account we click the register link, and then we’ll provide an email address, a desired user name, and a password. A confimation email well be then sent to the email address we provided. Once we confirmed that email address, we’re all set to go. When our account is activated, we can access its API key. The API key is a secret key that provides us with the token that identifies us in the NuGet gallery. We’ll enter the API key in the Publish key field and click Publish. To keep the package private and unlisted in NuGet gallery we can check Unlist this package so that it doesn’t appear in the search results. We can manage our published packages on the NuGet Gallery at https://www.nuget.org/account. Now, we have successfully published the package using only the command line. The most common way is to simply use a folder in a local filesystem or a shared folder. 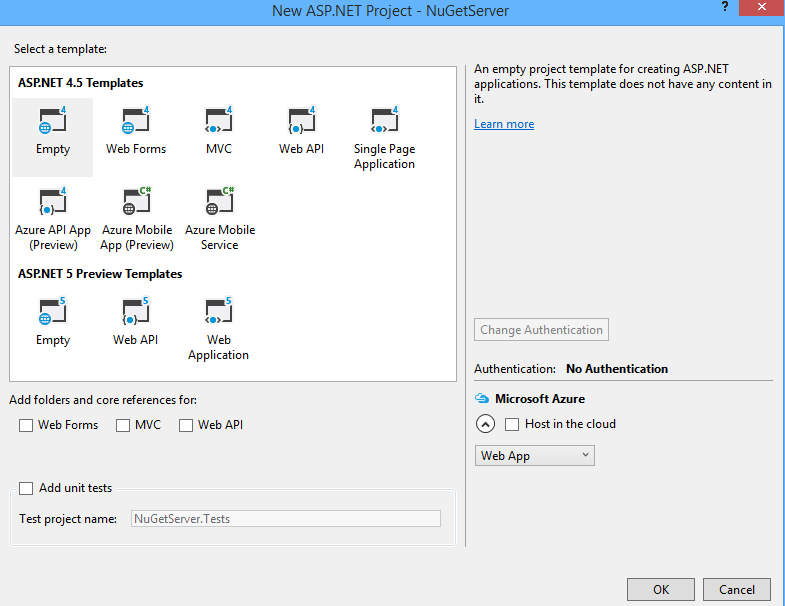 Another method is to create a simple NuGet Server by using the NuGet.server package from the NuGet Gallery. 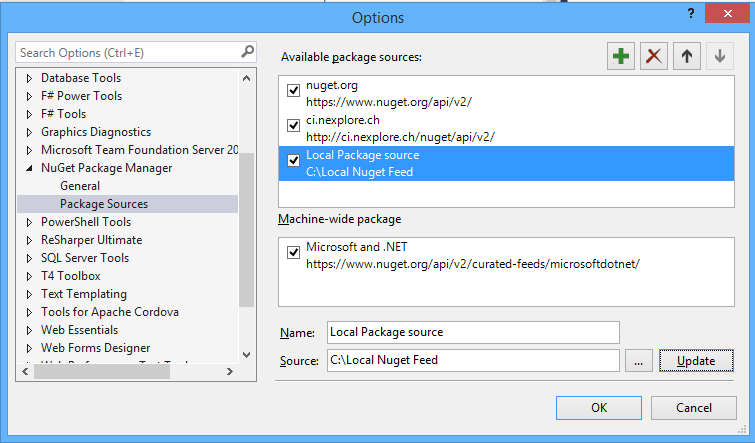 This package has all the necessary components to get NuGet server up and running in a short time. To host the NuGet Server we’ll need IIS. 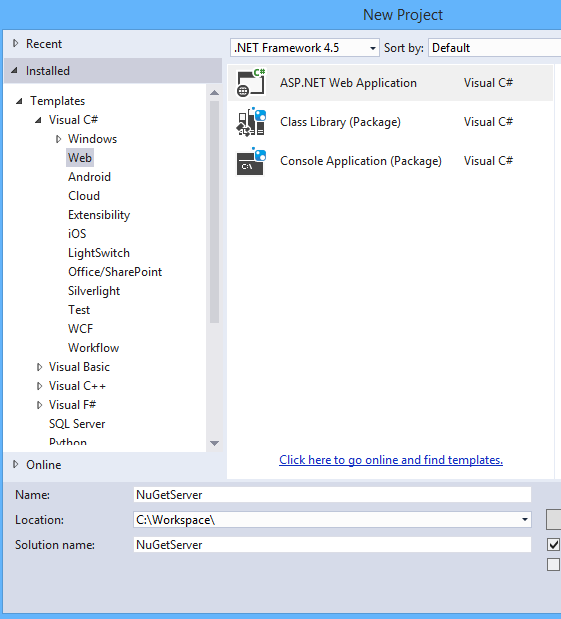 We’ll create an empty ASP.NET web application. In Visual Studio, we’ll navigate to FILE -> New -> Project. We’ll select ASP.NET Web Application. We’ll name the project as NuGetServer. We’ll select Empty and we’ll click OK.
An empty web application is created containing only web.config. 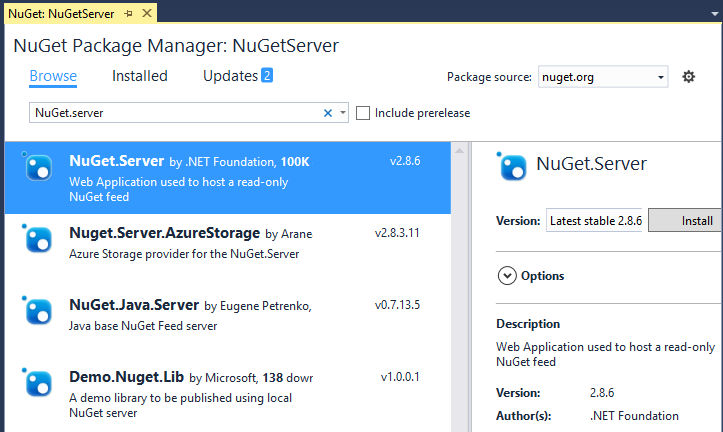 We’ll Install the NuGet.Server package from the official NuGet Gallery. Let’s set the apiKey setting in web.config file to MySecretPassword and publish the package previously created in our newly created NuGet server. The uploaded package should be by default in our Packages folder. 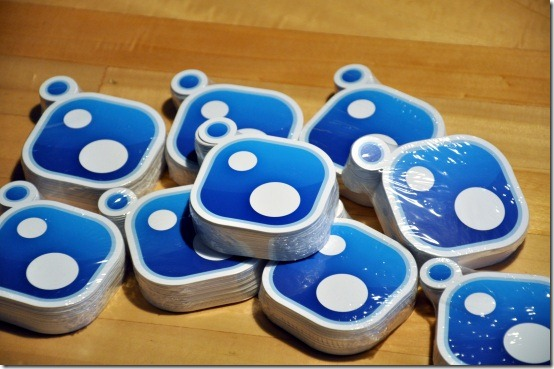 With NuGet Gallery, we’ll have the same experience as we have on www.nuget.org site. The steps to build and run the Gallery can be found at NuGet Gallery Github Site. Well, that was a very long post so I am going to leave it for now. If you have any questions, drop me a message in the comments section below.